As the parents of 19 kids and six (soon to be seven) grandchildren, Jim Bob and Michelle Duggar have a lot of useful parenting advice to share. Here's a Jim Bob Duggar "ism" that we hope you enjoy. Do you agree with his statement? Why or why not? No,, I don't agree with this. 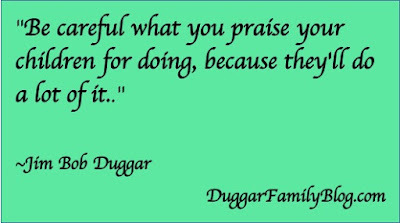 If you praise your children for doing something good and they do a lot of good, what's the problem? As a parent myself, this just doesn't make any sense. Wow. I agree with this statement. 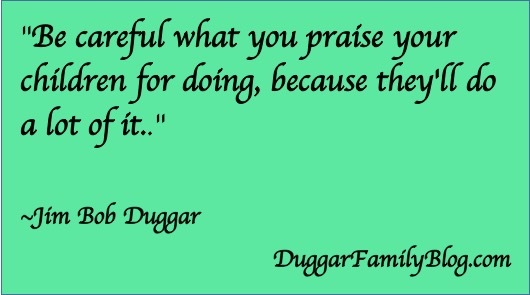 You always want to praise your children and very often. I'm guessing that what he is saying that praising our children is fine but you don't want to cause a spirit of pride to develop in them. This could cause them to have wrong motives for doing the right thing. In other words, children need to be taught to do the right thing without always expecting to be praised for it. I think it helps to prepare them for when they are older and they may not get recognition or praise for a good deed. Hmm...we only praise for positive reinforcement which helps others and includes sociably correct behavior. Praising also builds positive self-esteem and opens windows to explore natural skills and gifts. I've no idea why a parent would make a poor choice they would regret. His statement reads like he has. "Be careful what you don't let your children do, because they may end up doing a lot of it." I do NOT agree with Jim Bob's "ism" about watching what you praise your child for doing. If it is something positive (which should be the only things that should be praised) then praising your child would be a great thing and having them do it over and over again would be good. For exampled....my son took the initiative to take out the trash without asking, I praised him for doing so with the hopes he would do it more often. I really do NOT understand some of the parenting tips the Dugger give. But, if it works for them, then that's good for them. I think by mow he has a few insights at least! Thanks! Yes I agree..whatever you praise your child for..he or she will want to do that more! I totally agree with this, because I have found it to be true when my parents praised me. Are you still in contact with the Duggars? I would really like to get some advice from Jim Bob, of how I can contact Jana? I am a 26 year old Christian guy trying to find a Christian wife. I know, all in God's timing, but I don't feel like I should just sit here. There need to be some kinds of actions. I've been praying for someone to enter my life, and I cannot seem to shake the thought of Jana? I don't know, maybe it's just me; really I feel like theLord is leading me in this path. Oh my word! I laughed so hard! That's got to be one of the things I miss about the Duggar show is Jim Bob's humor!!! The two newest Counting On shows were the best so far. Lots of great humor through the whole show and especially loved Jim bob and Michelle. Anyway, yes I love his saying, it starts out like a little nugget of wisdom, yet after Jim Bob says it, I can just see a kid picking his nose or something. I never thought Jim Bob had a sense of humor. I just thought he had a hard time filtering what he was about to say, so he'd say anything, no matter how goofy it was. And TLC was happy to air it. Once a politician, always a politician. I loved Jimbob myself, I loved his humor. He had me laughing to. I love counting on now because I think with Jinger's wedding I might get a chance to see him more. The only thing I can recall the Duggars praising their children for is "loving the Lord." I'm not sure I've ever witnessed them praising their kids for anything else. I agree, that's great advice. I miss Jim Bob and Michelle's pearls of wisdom. God has truly blessed them. They understand things about raising kids that most people will never be able to comprehend. Really because their hearts aren't ready for such wisdom. You can't control anyone, but you can control how you respond.